Remember the comfort mouse model that Shelley sent me? Well she very kindly sent through the plans so everyone can have a go. I've dropped it into a pdf file which you can download for free at the end of this post. 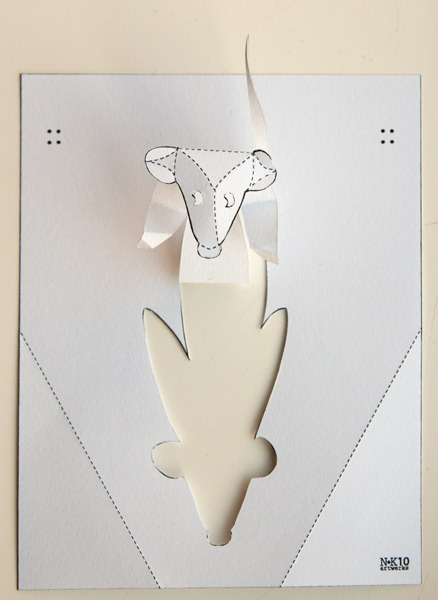 Shelley wrote an interesting post on Paper Forest about how she designed and made the cards. I'm glad we've got access to this card so early, it's going to take me all year to learn how to knit those little tiny mittens! Pow Wow! How fun to see this file folded up by Rob Ives himself!!! Wow! Thanks so much for hosting the file here, Rob. I hope people have fun making the little guy. Oh, dear, nice paper model! Oh, dear, nice paper model! Simple but charming. 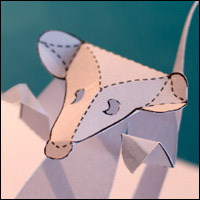 Give a look at Youtube video our papercraft Pal, Shelley singing…beautiful! Thanks for that link Hugo! I think everyone should sing a little tune on their paper demo clips! Can't wait to hear which one Rob will pick for the possible tail-wagging dog! "How Much is that Daawwggie in the Window…"
"The One with the Waaaggily Taaaiiil…?" Noooo! You really don't want to hear my singing!